PR1ME Mathematics has given teachers and students a different perspective on the meaning of and enjoyment surrounding the world of mathematics. I have had so many comments from parents saying that PR1ME Mathematics is way better quality and standard than what their kids used to learn in their previous schools. I am glad to be able to give such high quality to my students! My scholars are excited about Maths and they are enthusiastic about the math meeting and math board. Following the assessment at the beginning of the term there has been a lot of development and growth as the term 1 assessment has shown that even my low ability scholars have improved tremendously with the use of PR1ME. I love PR1ME Mathematics because it challenges and grows students thinking capacity. PR1ME allows the everyday individuals who may have never had the opportunity to study content of this nature at this very young age. I have seen students grow to achieve competency in answering all those questions that they thought were too difficult when they first joined SPARK. I love PR1ME Mathematics because it uses the 3 stages of learning in such a simplified and accessible way. I especially love exploring ways to assess their abstract understanding of the objective. I see my scholars challenging themselves more so that they score higher than their previous assessment score. Students are loving the colourful visuals, opportunities for hands on and the whole culmination experience really helps turn the light bulb on for them. I’ve seen a marked increase in the movement along the numeracy continuum for all children in my class. We are experiencing heightened interest levels in what we are doing in mathematics. The visuals and presentation of lessons are engaging and motivating for students. They can ‘see’ the learning — it's not abstract. 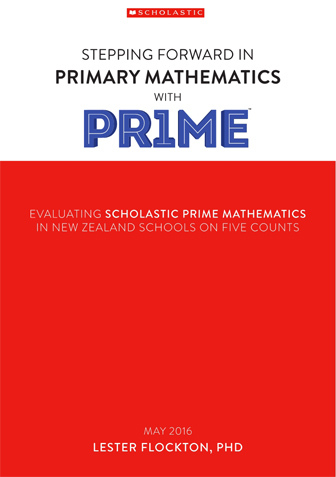 Scholastic PR1ME Mathematics is a very well conceptualised book which gives clear explanation of each and every concept. Also the teacher resource and the workbook is very helpful for preparing for the related topics. After one year of using PR1ME Mathematics, the Grades 1 and 2 teachers feel we have finally found a math program which excites and engages our students. Thank you for introducing PR1ME Mathematics books. The math books are colorful and inviting. The instructions are clear and easy to follow and the children enjoy math. PR1ME Mathematics has given our children a sense of ownership over the learning process. It has generated more mathematical discussion and more care and correctness in using mathematical language that is used right across the programme. Mathematics topics are covered very well in PR1ME Mathematics. Number knowledge/place value is very thoroughly covered in small steps within a teaching sequence that results in greater depth and retention of learning. The students manage and master these steps quite quickly and with relative ease.